The novel opens on a sweltering summer day in 1935 at the Tallis family's mansion in the Surrey countryside. Thirteen-year-old Briony has written a play in honor of the visit of her adored older brother Leon; other guests include her three young cousins -- refugees from their parent's marital breakup -- Leon's friend Paul Marshall, the manufacturer of a chocolate bar called "Amo" that soldiers will be able to carry into war, and Robbie Turner, the son of the family charlady whose brilliantly successful college career has been funded by Mr. Tallis. Jack Tallis is absent from the gathering; he spends most of his time in London at the War Ministry and with his mistress. His wife Emily is a semi-invalid, nursing chronic migraine headaches. Their elder daughter Cecilia is also present; she has just graduated from Cambridge and is at home for the summer, restless and yearning for her life to really begin. Rehearsals for Briony's play aren't going well; her cousin Lola has stolen the starring role, the twin boys can't speak the lines properly, and Briony suddenly realizes that her destiny is to be a novelist, not a dramatist.In the midst of the long hot afternoon, Briony happens to be watching from a window when Cecilia strips off her clothes and plunges into the fountain on the lawn as Robbie looks on. Later that evening, Briony thinks she sees Robbie attacking Cecilia in the library, she reads a note meant for Cecilia, her cousin Lola is sexually assaulted, and she makes an accusation that she will repent for the rest of her life.The next two parts of Atonement shift to the spring of 1940 as Hitler's forces are sweeping across the Low Countries and into France. Robbie Turner, wounded, joins the disastrous British retreat to Dunkirk. Instead of going up to Cambridge to begin her studies, Briony has become a nurse in one of London's military hospitals. 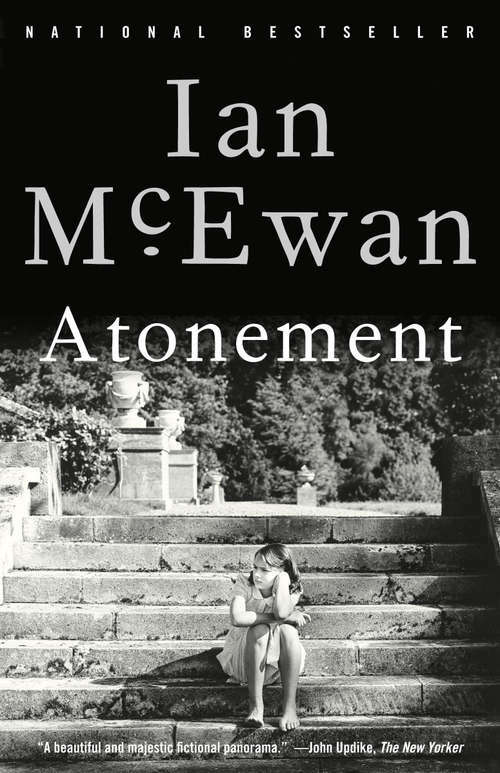 The fourth and final section takes place in 1999, as Briony celebrates her 77th birthday with the completion of a book about the events of 1935 and 1940, a novel called Atonement.In its broad historical framework Atonement is a departure from McEwan's earlier work, and he loads the story with an emotional intensity and a gripping plot reminiscent of the best nineteenth-century fiction. Brilliant and utterly enthralling in its depiction of childhood, love and war, England and class, the novel is a profoundly moving exploration of shame and forgiveness and the difficulty of absolution.From the Trade Paperback edition.